As always, please let me know if you find something particularly interesting or useful. “The Supreme Court rejected the government’s use of an exemption in the federal Freedom of Information Act (FOIA) to keep maps from the public. A Washington state resident wants Navy maps relating to its main West Coast ammunition dump. The individual will see those maps. For full text of the article, visit here. “The rise of new tools is leading to a cartography boom that offers new ways to see the world, states a feature this weekend in The Boston Globe. Thanks to satellites, surveying, and ever-increasing computing power, mapping has become geographically accurate beyond the dreams of a medieval mind. But many of those same technological advances have also brought us full circle: Maps have increasingly become vehicles not just for telling us how the world looks, but for organizing and representing all sorts of information. My favorite image is the Bolivian soybean fields. They look like snowflakes. Esri’s Certification Manager presents an overview of the Esri Technical Certification Program and discusses the benefits it offers to you and your organization. Truly phenomenal photos. You can actually see the Mars rover Opportunity in some of the photos. MONTPELIER — Emerson Francis Baker, 93, died Monday, March 7, 2011, at his home, with his family beside him. Born in Gloucester, Mass., on March 29, 1917, he was the son of Ida Frances ( Lorentzen) Baker and William Emerson Baker. He attended Gloucester schools, graduating from Gloucester High School in 1934. He served in Franklin D. Roosevelt’s Civilian Conservation Corps from 1935 to 1937 in Weston and Danby. In 1937, he was hired as a map draftsman by the Vermont Highway Department. He spent several years in the Vermont National Guard. In 1941, he joined the U.S. Army Corps of Engineers. In September 1946 , he rejoined the Vermont Highway Department’s planning division in Montpelier as head of the mapping section. He became mapping and road inventory engineer. In 1973 he transferred to the Vermont Tax Department to head the newly established statewide tax mapping project in the property valuation and review division in Montpelier and Waterbury. After conceiving and instituting the statewide orthophotomapping project known as the Vermont Base Map, he retired from state service in 1979. For the following two years he was retained by the property valuation division as a consultant and during that period also served as a mapping consultant to the state of Louisiana. In 1981, he retired permanently from the state, and for several years produced tax maps of a number of towns in Vermont for a tax-mapping consultant. He served on many committees relating to mapping and was a longtime member of the American Society of Photogrammetry and a life member of the American Congress on Surveying & Mapping, the Vermont Society of Engineers and the Vermont Society of Land Surveyors. I have attached a picture that hung in my office for 30 years. Emerson Baker is the one on the right with the light colored jacket. Gov Hoff is inking a contract with Raytheon to do a pilot project in the Hartland area with orthophotos and property lines. Emerson was working with Vtrans at the time he was tapped to start a search for a company to due parcel mapping of the entire state. When the state enacted the Property Transfer Tax (PTT) on real estate they needed the town clerks info and assistance to make it work. In turn the state promised the town clerks to do parcel mapping of each town statewide. With the original legislation, the first $500,000 went to the Mapping program each year. Emerson started his search, first he contracted with the state of Delaware (who had a good parcel mapping program) to generate a parcel map of the town of Whiting. The problem they encountered was there was not a good base map. The second pilot program was of the Hartland area, with the first orthophotograhy and parcel information. The knowledge of this pilot proved a statewide base map was needed in order to do good parcel mapping. 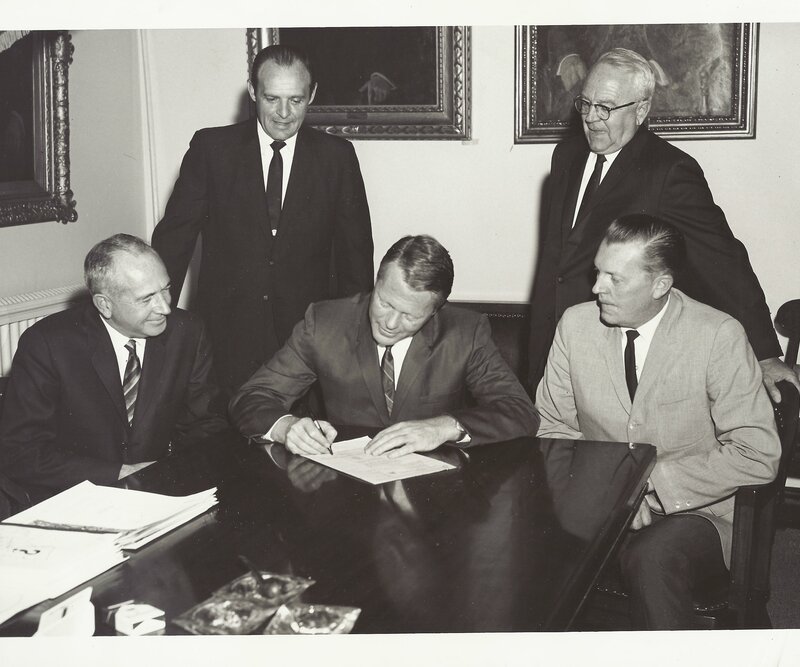 Thus a second contract with Raytheon was signed. The contract covered Windhan and Bennington counties. That contract called for 1:20,000, 1:10,000, 1:5,000, 1:2500, 1:1250 and in urban areas 1:625 scale orthophotography. In the second year of the PTT the legislation came back and changed the law so only the first $50,000 went to the mapping program, then in October of the same year, they totally eliminated any funding. At that point Raytheon dropped the contract and all the materials they had generated were shipped to Vermont in seven crates. These crates were 4 feet by 4 feet by 3 feet deep. Those crates were stored in a warehouse from 1974 to 1977. Somehow Emerson got $800,000 in funding in 1978 to restart the program in a different direction. The push was to create a uniform base map statewide that met National Map Accuracy Standards. Emerson designed the layout, coverage grid, accuracy. Basically he individually designed the entire package. Without Emerson Baker’s foresight, the state of Vermont would NOT have the orthophotography program that led the nation for many years. We all owe Emerson a lot. I, individually, learned more than I want to admit from the man. But I do owe Emerson a lot as we all do. I remember him well. He was very handsome with thick white hair and spoke with a drawl and had a great smile. He was a senior statesman when I met him in 1976 (approx) and had been around a long time and knew the ins and outs of government. He was a history buff as I recall and I seem to also recall he may have worked with the Civilian Conservation Corps helping build roads, bridges, parks, etc. He was a member (active member?) of the state CCC association. Great guy. I used to see him quite a lot even after retirement but I stopped seeing him around. From 1946 to 1973, Emerson Baker was the head of the Mapping Section of the Vermont Department of Highways (now the Agency of Transportation). His influence is still felt in the Mapping Unit. He created many of the standards that form the foundation of our work today, and we encounter his work every day, from the correspondence recorded in our town highway files, to various standards manuals he created. I started work at Forests and Parks in 1966. I remember Emerson coming into our office quite often to look at aerial photo’s that we had and talking with Bob Farrington and Norm Greene. He was a history buff and a gentleman to be admired. He was deeply involved with the CCC’s having been in the corp during the 30’s and in later life as it’s Secretary and President. A wonderful image of a basalt cinder cone and lava flow. The U.S. Department of Agriculture has just launched the Atlas of Rural and Small-Town America with the online mapping of more than 60 statistical indicators that include agricultural, economic and demographic data across the country. As a GIS professional, have you been wondering how to take advantage of the availability of Landsat data? Our very own Jarlath O’Neil Dunne of UVM’s Spatial Analysis Lab created this instructional video on how to access the USGS Landsat archives and bring that imagery into ArcGIS. Thank you Jarlath. A new vent has opened at one of the world’s most active volcanoes, sending lava shooting up to 65 feet high from the Pu’u O’o crater at Kilauea volcano, Hawaii. For a video of the recent ongoing eruption. Another video of the lava flowing into a fissure. Notice the helicopter for scale. The USGS Hawaiian Volcano Observatory with links to time lapse movies, maps and webcams. For more information on Vermont’s health, see, America’s Health Rankings. This paper presents a set of Geographic Information System (GIS) methods for identifying and prioritizing tree planting sites in urban environments. Lots of wonderful groups sponsoring this conference. The ArcGIS Online task server (tasks.arcgisonline.com) was recently upgraded to ArcGIS Server 10 SP1. Existing services were updated with the latest available reference data. In addition, new geocoding services are published that are built using the latest geocoding engine in ArcGIS 10. See Migrating address locators created with ArcGIS prior to version 10 in ArcGIS Desktop 10 Help for details on what’s different in locators created in ArcGIS 10. For all you closet mycologists out there, check out this article from Wired Science. Includes fantastic photographs of brain manipulating fungi. You are currently browsing the VCGI's Blog blog archives for March, 2011.